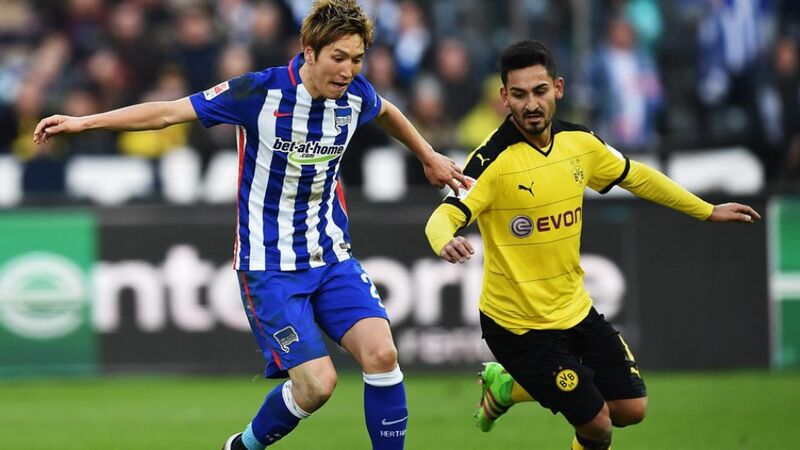 Dortmund playmaker Ilkay Gündogan had difficulty creating any openings in a hard-fought affair. The top-of-the-table clash resulted in an evenly-balanced affair as Hertha Berlin effectively cancelled out a Borussia Dortmund side that struggled to hit top gear. A rather uneventful first-half saw a surprisingly subdued Dortmund create little in the way of chances. The league’s top scorers failed to really threaten Rune Jarstein’s goal with free-scoring Pierre-Emerick Aubameyang in particular kept very quiet by a well-organised Hertha defence. In fact it was the home side that went closest to scoring but John Anthony Brooks’ powerful header following a corner went just over the bar. Dortmund started the second-half in more assertive fashion, tying Hertha down into their own half for long periods. Yet Thomas Tuchel’s side still struggled to carve out any meaningful openings. Borussia enjoyed the lion’s share of possession but again it was Hertha who had the best opportunity to break the deadlock. However, Salomon Kalou flashed his shot just wide following a long solo run. US international John Anthony Brooks excellently marshalled a very effective Hertha back line. Dortmund’s much-vaunted attack was kept at bay for long periods and it is much to Hertha - and Brooks’ - credit that Aubameyang, Reus, Mkhitaryan and co. never looked like scoring. After more than holding their own against a Dortmund side that has been irresistible in recent weeks, Hertha have firmly staked their claim for a Champions League spot. Pal Dardai’s well-organized side look comfortable in their lofty position. After the 58th Bundesliga encounter between Hertha and Dortmund, this is the first time both sides have been in the top three following the fixture.At this time last season, Hertha and Dortmund made up the bottom two in the Bundesliga, making Hertha and Dortmund the most improved sides in comparison to last season.The capital city side are now unbeaten in their last seven games in all competitions and have lost just one of their last ten (a 2-0 loss against FC Bayern München).